Obama was indirectly saying that the U.S. has the capability to unleash another scenario on its adversaries. It seemed that he was signaling to the world to “remember what the U.S. did to Japan during World War II, We can surely do it again! Japan is a vassal state with U.S. bases stationed in Okinawa and other areas. Is Japan a strong democracy without any foreign power that is accountable” to its people? or to those who live in the island of Okinawa? Maybe Obama should visit Okinawa and hear what the people have to say about “American-style democracy” with U.S. bases stationed on their land. Obama continued his speech with the audacity to talk about the “terrible conflicts” and how Washington has pushed forward the rule of law. This sounds like something the National Endowment for Democracy (NED, the U.S. based International Monetary Fund (IMF) , the World Bank, Wall Street and the main-stream media in the U.S. and the U.K. (BBC) have been doing since their inception. There are those who argue that the ideals enshrined in the U.N. charter are unachievable or out of date — a legacy of a postwar era not suited to our own. Effectively, they argue for a return to the rules that applied for most of human history and that pre-date this institution: the belief that power is a zero-sum game; that might makes right; that strong states must impose their will on weaker ones; that the rights of individuals don’t matter; and that in a time of rapid change, order must be imposed by force. “Might makes right” is what the US Government has been doing for the last 70 years. In fact, the U.S. has or has attempted to impose their will on sovereign nations since the end of the Spanish American War of 1898. Obama is not the first nor will be the last president to talk about imposing their form of “democracy” on the planet. What is the meaning of state sovereignty, the term which has been mentioned by our colleagues here? It basically means freedom, every person and every state being free to choose their future. By the way, this brings us to the issue of the so-called legitimacy of state authorities. You shouldn’t play with words and manipulate them. In international law, international affairs, every term has to be clearly defined, transparent and interpreted the same way by one and all. We are all different, and we should respect that. Nations shouldn’t be forced to all conform to the same development model that somebody has declared the only appropriate one. We should all remember the lessons of the past. For example, we remember examples from our Soviet past, when the Soviet Union exported social experiments, pushing for changes in other countries for ideological reasons, and this often led to tragic consequences and caused degradation instead of progress. When Libya was “liberated”, at least according to Washington, chaos soon followed. Before the U.S. orchestrated invasion by NATO, Libya was one of the most developed nations in the continent of Africa. Syria is now the focus of regime change for the Obama administration. Russia stepped into the war and now threatens Washington’s plan for Syria, which is to create more chaos in the region that would ultimately threaten Iran’s borders. Washington wants to impose their will on Syria just like they did in Libya and the results were indeed catastrophic. Libya was a sovereign nation that was trying to free Africa from the U.S. dollar with a gold dinar, an idea that lead to the death of Muammar Gaddafi in a violent coup which was planned by the Neocons from the Bush administration after 911. Obama is following the Neocon plan as Syria maintains its legitimate right to defend itself against the Islamic State with Russia’s military and political support. If Syrian President Bashar al-Assad is removed from power by the Islamic State, Syria will be destroyed and that will enable the U.S., Israel and their allies to launch an all out war against Hezbollah and Iran. Maybe Obama should listen to his own speech. Obama said that by “demonizing” their enemies leads to “tribalism or jingoism.” Obama’s speech was full of “jingoism.” In fact, the US government has been following a “warlike” foreign policy since the end of World War II. 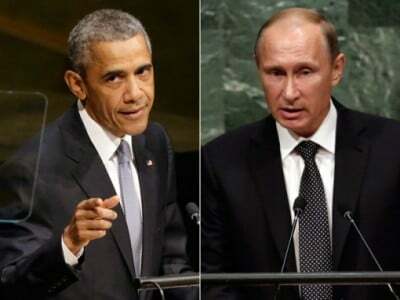 Putin was the true statesman while Obama spoke in a typical “jingoist” fashion. Obama made it clear with his speech that the future will be marred with war and violence and that is something Putin wants to avoid. Can Russia, China and Iran collaborate and stop Washington’s aggressive behavior towards the world? Call me optimistic, but I believe they can.